It was early February 1998, and I was just a couple of months into my Peace Corps service in the Republic of Vanuatu. I’d already lost 18 pounds from severe diarrhea brought on by a bout of giardiasis, but I was feeling better, and satisfied with my lucky placement on tropical Paama Island here in the South Pacific. Erin, my wife and fellow volunteer, was with me, and we were settling into our life as educators and community organizers. And then I got bit. One afternoon, as the late-day sunshine filtered through the breadfruit and mango and coconut and banana trees and filled Liro Village with a green and liquid light that I swear I could just about swim through, and as the fluttering sound cue signaling the evening news report on Radio Vanuatu emanated from a dozen shortwave radios among the bamboo-and-thatch huts, a mosquito looking for its meal found me. 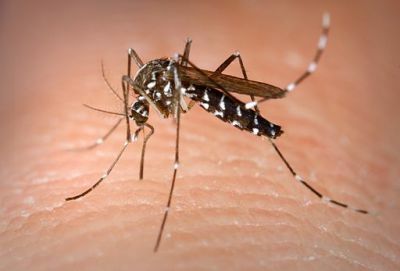 Most likely, it was a tiger mosquito, Aedes albopictus (pictured above), or maybe Aedes aegypti. Maybe the mosquito coil I’d just lit had yet to fill our house with its distinctive scent. Maybe I figured the malaria prophylaxis I took each week would protect me. “The incidence of dengue has grown dramatically around the world in recent decades,” reports the World Health Organization, with 50–100 million dengue infections, and 25,000 deaths, worldwide every year. That’s a problem. I learned that, and more infectious diseases epidemiology, as a medical journalism grad student at the University of North Carolina at Chapel Hill. One day, I heard about a physician-scientist on campus who wanted to study dengue antibodies in the hopes that he and his lab could help develop a vaccine against dengue. I walked over to the medical center and offered my arm to a syringe. Maybe it stuck me in the same place that that mosquito had bitten me years before, or maybe not. One way or another, my donated blood would be able to confirm that I had indeed had dengue, and if so, which of the four serotypes. Erin also donated blood to the study. An email from the lab tech arrived six months later: dengue virus 2 antibodies were in my blood. I was happy for the confirmation, but now worried that if I visited Vanuatu or another country with the virus, I’d be at risk of getting secondary dengue. If infected with a different serotype, I might get dengue hemorrhagic fever. That’s more deadly. Not good. So that’s why I was sitting in the Jones Building Auditorium at Duke University earlier this week attending the Symposium on Insights and Solutions for Emerging Infectious Diseases. This was a meeting of physicians and scientists from Duke and its sister institution Duke-NUS Graduate Medical School Singapore, and others from UNC-CH, UCLA and the Karolinska Institutet in Stockholm, meant to foster collaboration and inspire faster development of diagnostic tests, therapies and vaccines. I was clearly the least intelligent person in the room. These were experts in henipaviruses (Linfa Wang at Duke-NUS and Benhur Lee at UCLA), coronaviruses (Ralph Baric at UNC-CH), human immunodeficiency virus (Barton Haynes at Duke), Cryptococcus gatti (Joseph Heitman at Duke), malassezia — it’s on every one of us, and causes my tinea versicolor — (Annika Scheynius at Karolinska) and influenza (Vijaykrishna Dhanasekaran at Duke-NUS). Then Aravinda de Silva from UNC-CH got up and started explaining his research into the molecular basis of dengue virus neutralization by human antibodies, and how his lab had enrolled 80 volunteers who had experienced primary dengue infection during travel to an endemic region. “He’s talking about me,” I realized, and I had to bite my tongue in order not to interrupt him right then and there and share my excitement with the auditorium. I waited until the end of the session, and since it turned out he was sitting in the seat directly in front of me, I immediately told him how proud I was to have been part of his study. Right away, he remembered that Erin had participated, too. The next day, Dr. de Silva sent over a copy of the paper his group had published in PNAS (Identification of human neutralizing antibodies that bind to complex epitopes on dengue virions), and Erin and I sat on the sofa reading the article, wondering if we were one of the select samples noted in the tables showing the antibody levels after each experiment. I got so excited talking about what it felt like to see myself in this research paper that I jumped up and down in the living room. That mosquito bite on a faraway island 15 years ago was a nuisance then, and a danger. Now I know it was also an opportunity to participate in a world of learning. Search ScienceSeeker to read other blog posts about dengue research.